Design itself is about intent and creativity. Geography is the science of our world. Geodesign is the fusing of design and geography to create a holistic, iterative design methodology whereby we inform design with evidence-based information drawn from a place’s geographic context–its environment and people. In most cases, geodesign is used in an urban planning setting, optimizing both form and function to enhance performance such as walkability. 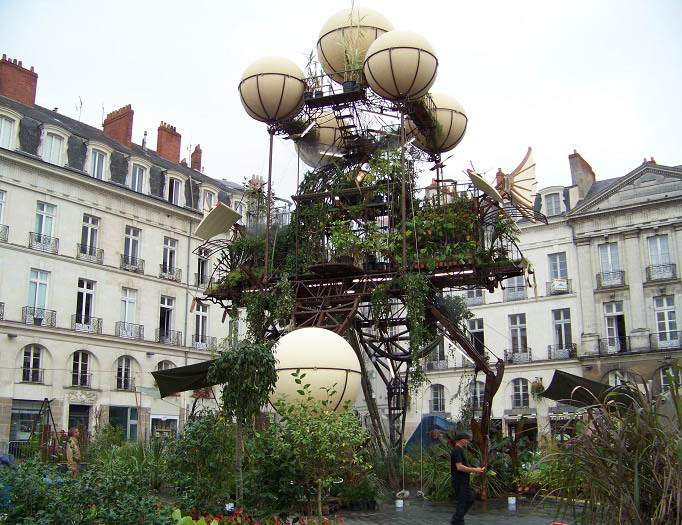 Artists and creative design: a roving green intervention/vertical food garden in Nantes, France. Photo by Shannon McElvaney. Biomimicry is also about designing with nature, but with a slightly different twist. Biomimicry looks to biology as a way stimulate creative thinking and technological innovation, calling on nature’s treasure chest of 3.8 billion years of evolution for inspiration. The strength of the spider web, the self-cleaning leaf of a lily, and the clinging burdock burr (seed) have all spurred technological innovations. Imagine if we combined biomimicry with geodesign. The goals are similar: both require design thinking, both consider nature, and both aspire to create a better world, one that is more in harmony with nature’s processes. The biomimicry and geodesign workflows are incredibly well-aligned and we have much to learn from each other. Urban form and structure is currently out of alignment with natural systems. Ecological services, the urban metabolism, and sustainability indicators are all ill-defined or fragmented. We can learn from nature, but we need a common language–and for us, that common language is geography: the patterns, relationships, and flow of things on the earth. What might such collaboration look like? How about an application that uses the power of geoenrichment to drill down through countless datasets to, in short, find everything that is known about a given location–looking vertically, across all disciplines, in order to find meaning. Suddenly weather and climate are important to housing location and position, the white hairs of a sage leaf inform the required reflective value of roofing material, and the ability of the desert tortoise to store water during long months without rain inspires water catchment systems for your neighborhood. And this is just the tip of the iceberg. Over the coming months, we will dig deeper into the potential for synergy between geodesign and Biomimicry. To be a part of the discussion, join Janine Benyus, co-founder of Biomimicry 3.8, and Jack Dangermond, president of Esri, next month at the Geodesign Summit in Redlands, California. 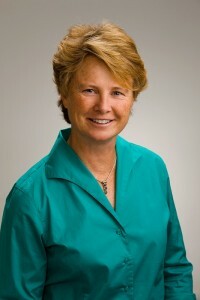 Join Janine Benyus, co-founder of Biomimicry 3.8, at the Geodesign Summit in Redlands, California.